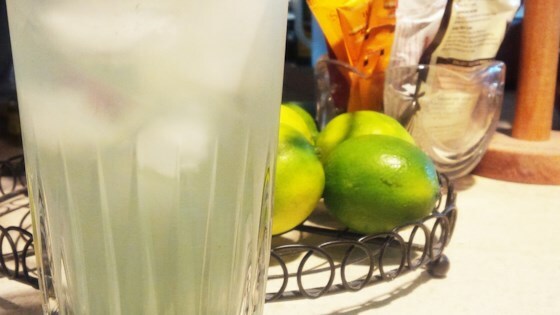 "A delicious and refreshing drink made with limes. Serve over ice on a hot day." Cut limes in half and squeeze lime juice into a 2 quart pitcher. Add sugar and stir until dissolved. Fill pitcher with cold water, stir and chill in refrigerator. I did as someone else mentioned and used less water. To make a gallon, use 1 c. lime juice, 1 c. sugar and 1 gallon water. Could add cherry juice or Koolaid to add another flavor. Bad recipe - it came out too watery. Be sure to taste as you're adding the sugar water. Way too weak. We used the same amount of sugar and 15 limes for 2 quarts of water, and it was good.